I am only afraid at the beginning of speaking in public, especially the moment I am about to open my mouth. Sometimes this leads to a trembling voice. However, after I start speaking, I calm down and become confident. Can you tell me how to overcome this? You are lucky that your stage fright is only right before and as you begin to speak. It is natural and normal for many speakers to feel some adrenaline symptoms right before a speech, including a trembling voice. They might feel a rapid or pounding heart, maybe some body tension, maybe a little cold or warm . . . things like that.First, it is important not to worry about those feelings. No one can see them. They don’t mean anything about how your speech will go.And in your case, as you say, you know they will go away once you get started. 1. Warm up your throat. A tense throat is more susceptible to producing a trembling voice once you begin to speak. If the situation allows, before you go up to speak make a soft humming sound to open your throat and warm up your vocal chords. This will keep your throat and vocal chords relaxed and ready to speak. Then a soft, open, deep “aaaahhhh” sound will move you even closer toward relaxed speaking in words. 2. Translate sound into mental words. Immediately before you start speaking (with your throat open and relaxed), mentally think the first word or words of your speech. That way your throat and vocal chords will be ready for the sound to come through. 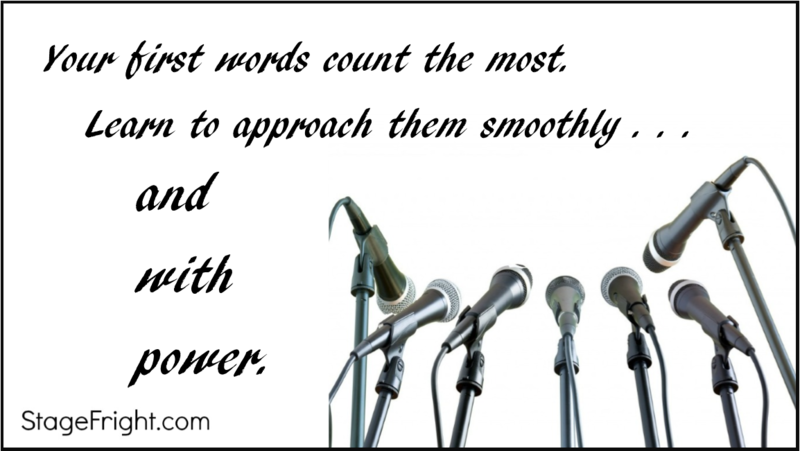 You will be practically already speaking before you actually begin to speak to your audience. This is a way to “ramp up” to your first words gradually, rather than asking your voice to suddenly “dive in”. 3. Stay loose. Remember, a little adrenaline is not the same as stage fright. Remembering this can counteract a trembling voice. What you are experiencing may only be adrenaline, and that can be a good thing. If you mis-label it as fear if it really isn’t, it can add to your difficulties by making you tense up or clamp down trying to fight against those feelings. It is important to stay loose and not tense up against them, but to allow them to move through you. And for you specifically, it is especially important to pay attention to your jaw, neck, shoulders, throat and vocal chords. 4. Practice ahead. Let your mind get familiar with the words you intend to use. Whether or not you have those opportunities before the real situation, practice them in private so you can use them in the real situation. Practice relaxing and opening your neck and throat as you breathe in, in preparation to say a word or make a sound that will move through your vocal chords and “ride” on the out-going air. As you breathe in this way, you will probably notice your chest and belly opening and relaxing at the same time. Practice this until this is automatic and you can go to that position quickly. Then practice speaking a few words, or the first few words of your talk, allowing the sound come up from your belly and chest through your relaxed and open vocal chords. The more you practice this in private, the more quickly and automatically you will be able to relax and open your throat right before the first words of your actual speech. Then your voice will be smooth and you can go confidently into your opening lines. 5. Channel your adrenaline. At the time of your presentation, harness your adrenaline to give clarity and power to your message and any trembling voice will tend to disappear. Picture a boxer preparing to go into the ring. He is feeling tremendous adrenaline at that moment. He starts dancing around, bouncing up and down, moving his neck and head back and forth, to stay loose. He is giving the adrenaline something to do as it builds toward the moment he enters the ring. Then he directs all that adrenaline into his powerful entrance and the beginning of the fight. You can use the same strategy. If you are out of sight of the audience right before you go on, it’s okay, actually helpful, to move around and stay loose as you direct your adrenaline toward the beginning of your speech. In fact, it can give you more positive energy and emotional conviction to put into your message. P.S. Be sure of what you are going to say. It also helps to know exactly what those opening lines are, so you are not dealing with any risk or uncertainty at that moment.